Everyone Can Participate in BOOTS FOR CHANGE! Farmers, farmers’ market managers and community organisations – and market shoppers – are invited to be part of this exciting BOOTS FOR CHANGE campaign to Support Farming Families. Market managers are encouraged to run at least one BOOTS FOR CHANGE MARKET during April 2016. 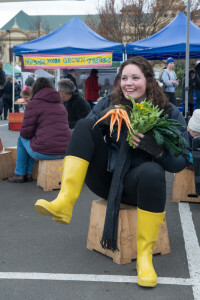 Some markets that trade weekly may choose to run several BOOTS FOR CHANGE Markets in April – it just depends on whether your farmers’ market trades weekly or monthly. So pull on your boots and support your local farmers and food producers! The 2016 BOOTS FOR CHANGE Campaign has concluded. Watch out for more BOOTS FOR CHANGE updates! You are invited to get involved by theming your market stalls along ‘boot lines’, wearing your favourite boots, recycling old boots in innovative ways – anything that shows you support putting your Best Boots Forward! That’s easy – just be sure to wear boots to your local Farmers’ Market during BOOTS FOR CHANGE month in April 2016. Use your imagination and Support Farming Families!